Rhubarb Custard Pie – Like My Grandma Used to Make! Much to my delight, I discovered we have several rhubarb plants in our yard here at our Swedish house. My grandmother was the best pie maker, and one of my favorites was her rhubarb custard pie. I couldn’t wait to make one! When I posted a photo of this on my Facebook page, several people asked for the recipe, so here it is. I didn’t have a pie plate here, so I used this 10” square pan. And, I didn’t have a rolling pin, so had to adapt a no-roll pie crust recipe I found online. I liked this one because it used both butter and oil. Mix dry ingredients. Stir in grated butter to distribute evenly. Add milk and oil. Stir. Dough will be crumbly. Press into bottom and up the sides of a 10” square pan (a 10” pie pan or 9” x 13” pan would work, too). Chill while preparing filling. Cut rhubarb into small pieces and spread over crust. Whisk remaining ingredients. Pour over rhubarb. Bake at 350 degrees 50 – 60 minutes, until custard is set. About 5 minutes before pie is done baking, prepare meringue. Beat egg whites and cream of tartar until foamy. Gradually add sugar and continue beating until stiff peaks form. 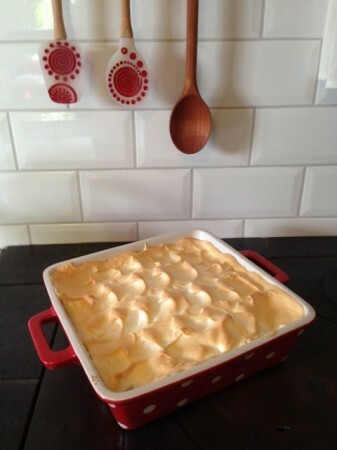 Spread meringue over top of pie, all the way to the edges. Make peaks with the back of a spoon or edge of a spatula. Return to oven for 10 minutes, or until meringue is golden brown. You can serve this warm or cold. Refrigerate after a few hours.